Keeping up with national and international events was a lot easier when all the news came from one of three major TV news outlets and a few newspapers like The New York Times. Now, there are dozens of channels, hundreds of newspapers, thousands of bloggers, and tens of thousands of social media journalists — all trying to get your attention with the latest apocalyptic news flash. Stories based on gossip as much as fact used to be designated Yellow Journalism. 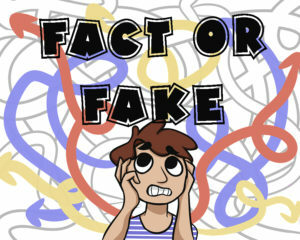 Now, in what has been called a post-truth society (defined by Oxford Dictionary as “relating to or denoting circumstances in which objective facts are less influential in shaping public opinion than appeals to emotion and personal belief”), it is the reader’s responsibility to differentiate between fact and fake news. Sounds like something every thinking person would want to avoid but a recent Stanford Graduate School of Education report shows that 80-90% of high school students had difficulty judging the credibility of news. So how do we teach students to know the difference? Fake news is created to influence public opinion or make money — not to educate. Real news is often not nearly as compelling as the world-ending conclusion that couldn’t be proven. Readers see a particular news story or set of facts all over the Internet, making them assume it must be true. Startling news becomes a weapon against whatever the reporters are trying to counter, to prejudice readers against one side and thus in favor of another. In fact, American courts of law (as well as others) have the right to decide if disturbing or surprising facts might unreasonably prejudice the jury against the defendant. There are no such laws in news media. An abundance of fake news can convince readers that no news is to be trusted. In Turkey, only 38% of their citizens trust the news. In America, less people trust major news outlets than trust Congress (I’ll let you think about that one). France wants to allow judges to order the deletion of false online content in election periods. The European Union has so far refused to issue broad-ranging regulations against fake news but does ask news agencies to self-monitor this problem. The EU’s GDPR (General Data Protection Regulation) encourages that personal information has “the right to be forgotten” by browsers for a variety of reasons such as it’s too difficult to determine the veracity of the information. The value of research is to find the truth but let’s face it, lots of kids start a research project sure they know the truth (for example: “Yes, global warming is a problem” or “No, smartphones aren’t bad for you”) so why spend hours on research to research a conclusion they already know? And what happens if they don’t find what they expect? 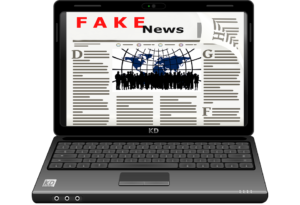 Inconveniently, fake news can be found to support pretty much any opinion so the challenge teachers face is to make students aware of the difference between fact and fake. This means teaching media literacy skills that show them how to tell the difference. News story: an objective reporting of the facts of a situation in a certain amount of depth through the lens of a neutral reporter. Op-ed: an opinion piece that may include many of the same facts that are in a news story but presented through the lens of the writer’s opinion or bias. That’s not good or bad. In fact, if you trust that person, you might want to read their distillation of facts. Don’t look for unbiased reporting in an op-ed and don’t look for opinions in the news. And, if a journalist self-reports that s/he can no longer be objective, move them to the opinion/op-ed category. A good way to help students differentiate these is to make them familiar with real news. Read and discuss it. Talk about why it’s one or the other. Help them determine what pushes stories from news to opinion to — horror — fake news. Be clear on the goal of the writer. If it’s in a news outlet, the goal is to provide information so people can draw their own conclusions. If it’s found in social media, the social media writer’s primary goal is that the story be read, shared, and liked which all translate to revenue for the writer/publisher. For example, when researchers analyzed 200 highly-shared Facebook posts offered as facts on the 2017 Zika virus, 12% had misinformation. Rather than pursue a goal of educating readers, they used hyperbole, emotion, and popular opinions to gain clicks and ad revenue. But, social media is not supposed to be a reputable source for news. Facebook, Twitter, and their like are gossipy in intent, as friends might chat with each other. They don’t try to hide that. So, if your goal is to find the facts and draw a conclusion, social media would not be your best source. One: The story uses facts and figures rather than hyperbole or emotion. Those include links to allow readers to verify information and/or dig deeper to satisfy concerns. Two: The story relies on transparent primary sources, not someone’s interpretation of what was said, and the sources aren’t named “Anonymous”. Additionally, the source isn’t 1) another news agency, or 2) any social media outlet. Three: If the story refers to quotes or video clips, there is a link to the entire media so it can be evaluated independently. This ensures what you’re seeing wasn’t taken out of context. Four: The outlet publishing the story is balanced in its reporting, not leaning one way more often than another. If you find that it publishes, say 90% of stories negative on a certain topic, you probably aren’t dealing with an unbiased reporting of facts. Five: Articles and attributions must be recent, not years old. Lots changes in very little time, even in science. Pluto was a planet when I was in school. In an ongoing quest to avoid fake news, you can change browsers (Google isn’t the only one out there) and fact-check (which takes time), but the most effective approach is to take nothing at face value. Read, analyze, and critically think before drawing conclusions. Jacqui Murray has been teaching K-18 technology for 30 years. She is the editor/author of over a hundred tech ed resources including a K-12 technology curriculum, K-8 keyboard curriculum, K-8 Digital Citizenship curriculum. She is an adjunct professor in tech ed, Master Teacher, webmaster for four blogs, an Amazon Vine Voice, CSTA presentation reviewer, freelance journalist on tech ed topics, a weekly contributor to TeachHUB, and author of the tech thrillers To Hunt a Sub and Twenty-four Days. You can find her resources at Structured Learning.